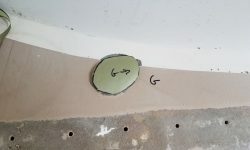 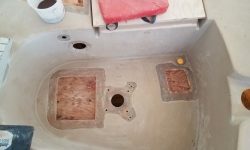 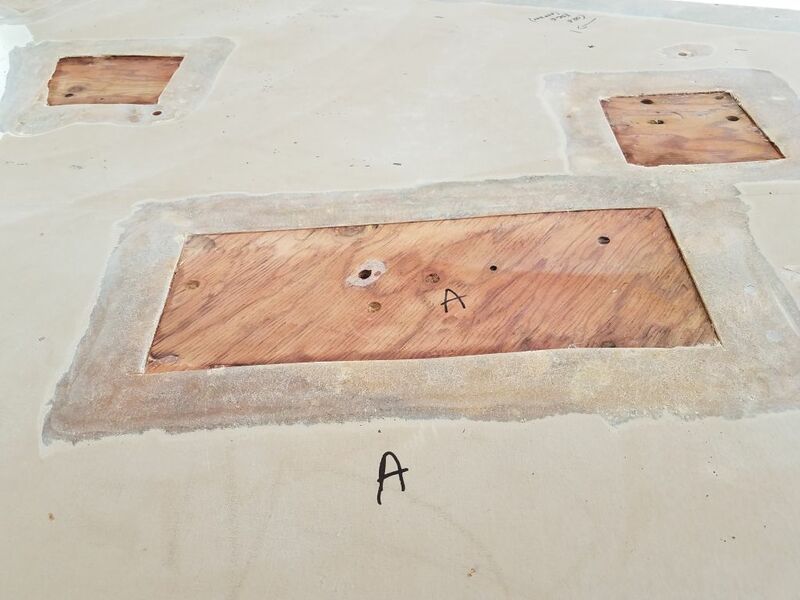 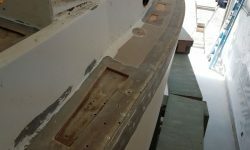 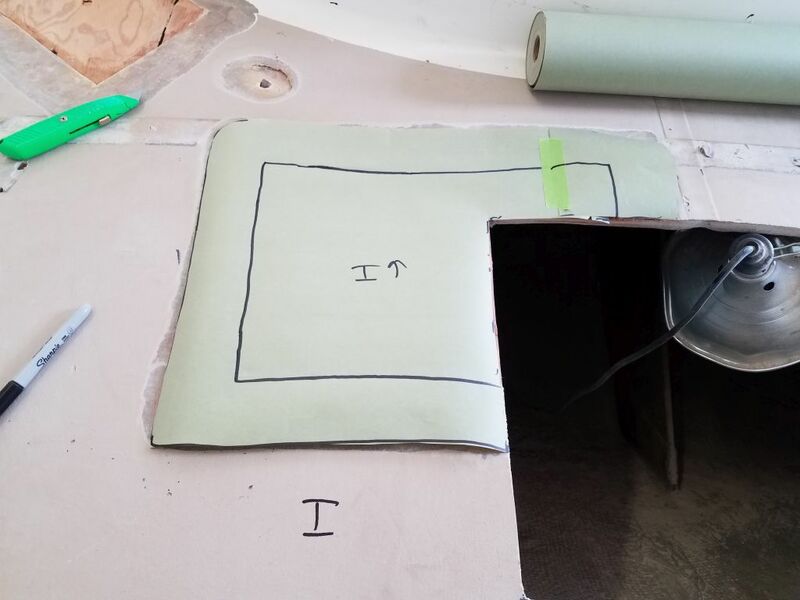 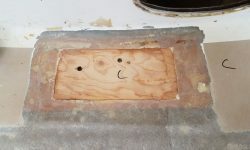 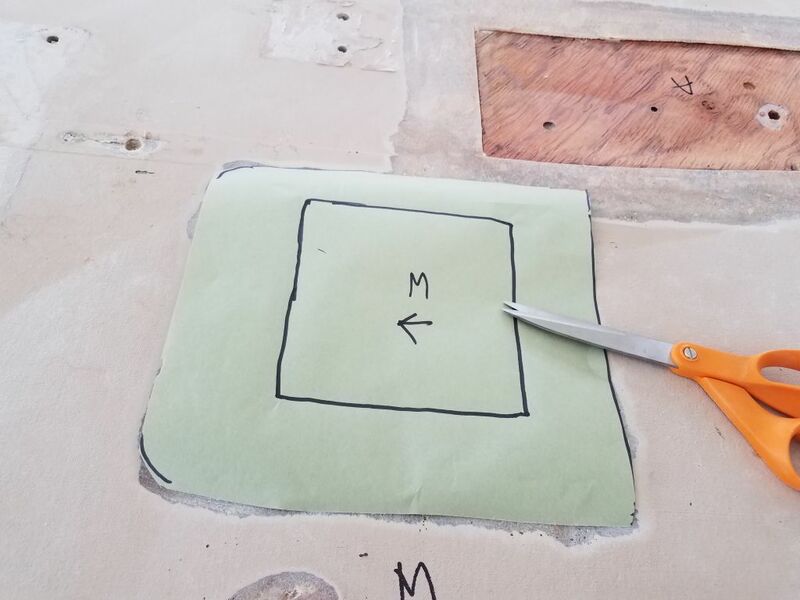 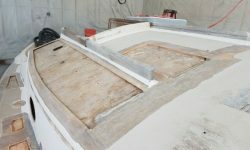 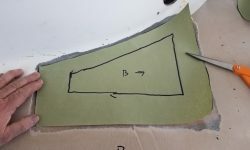 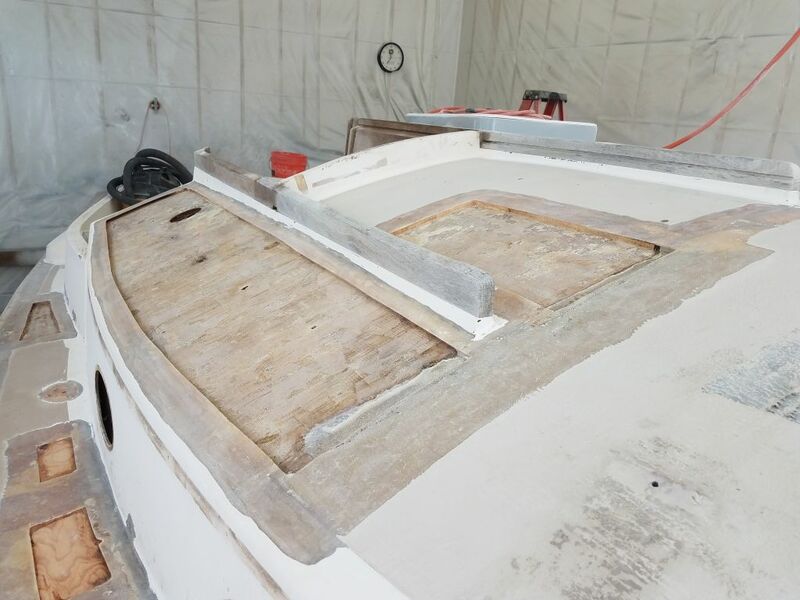 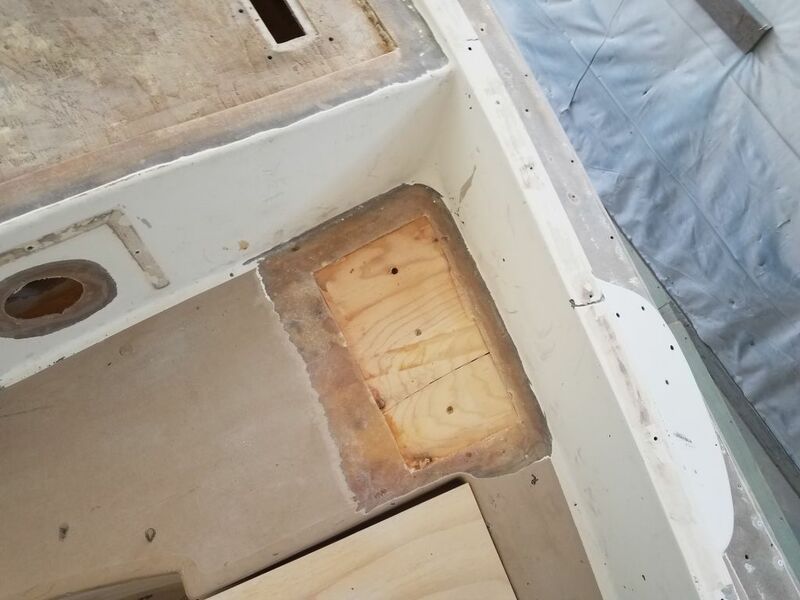 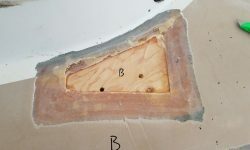 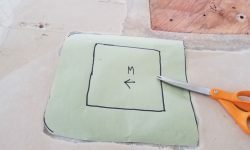 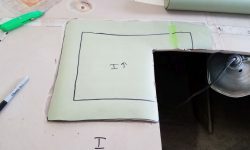 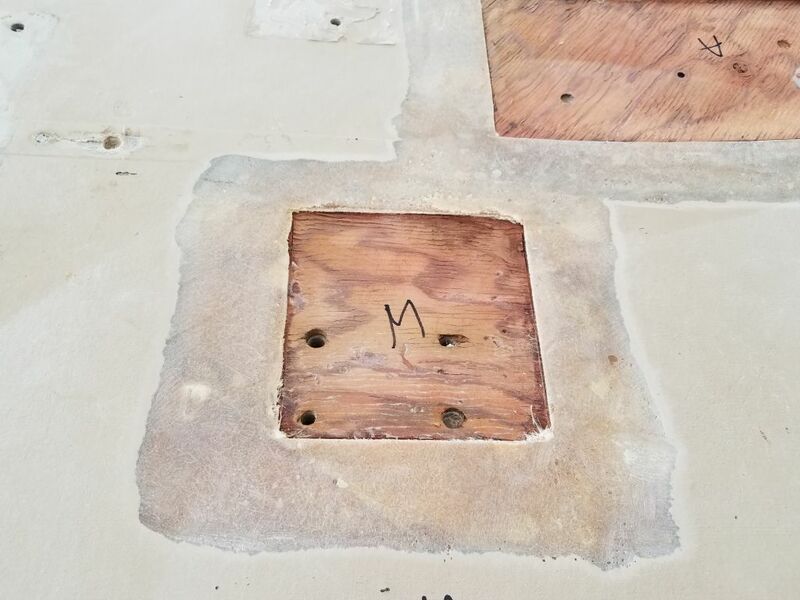 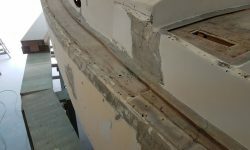 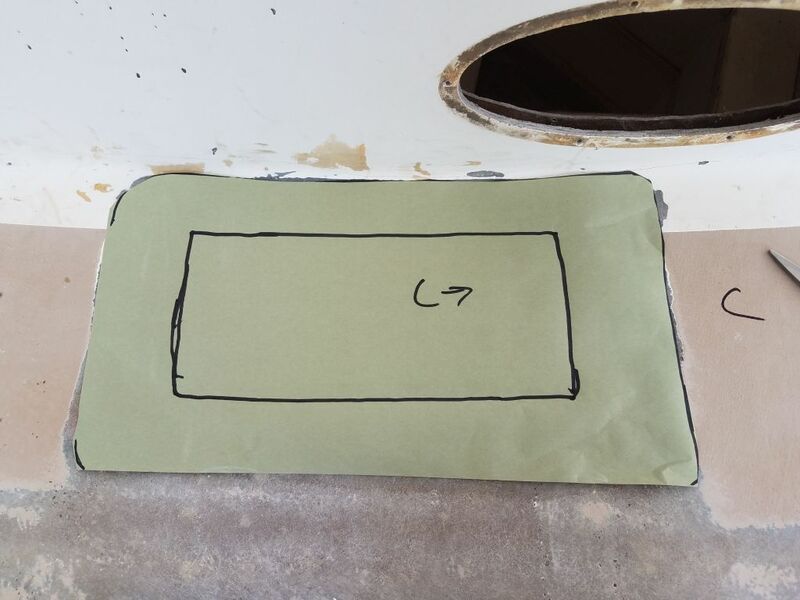 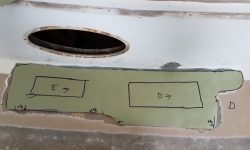 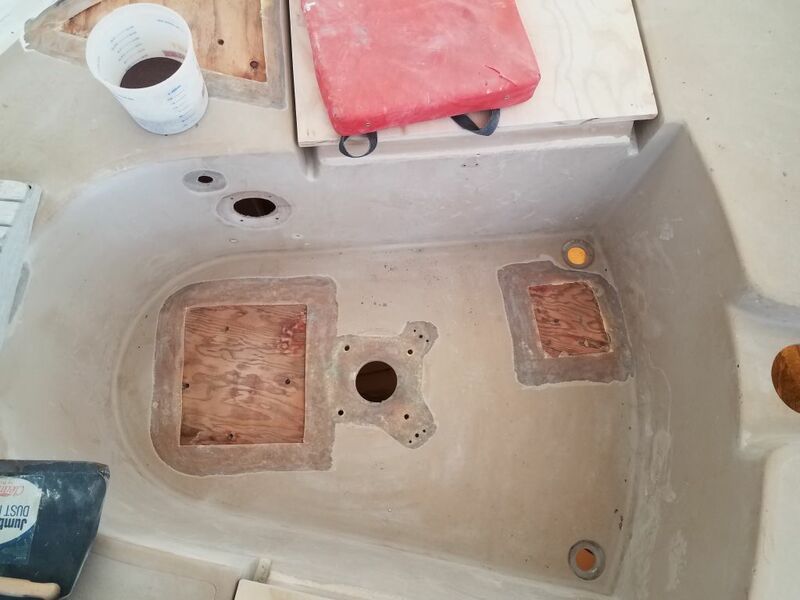 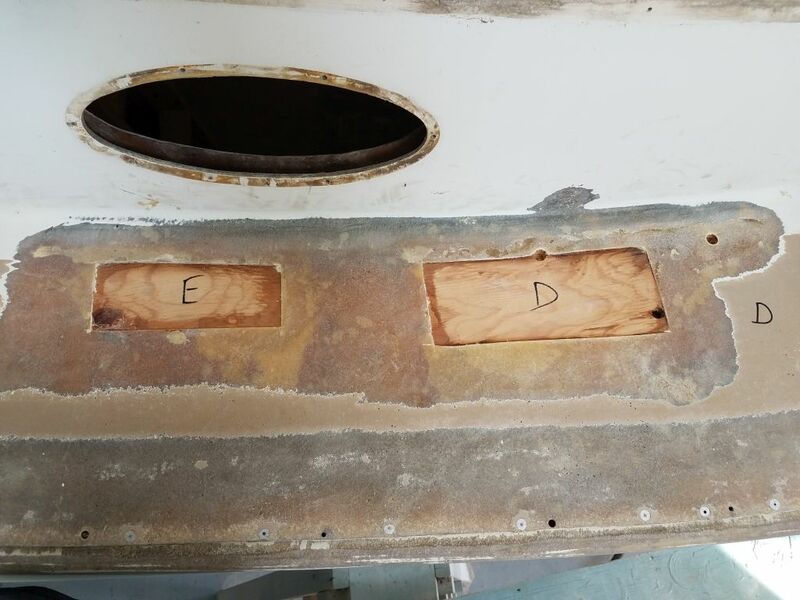 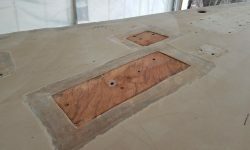 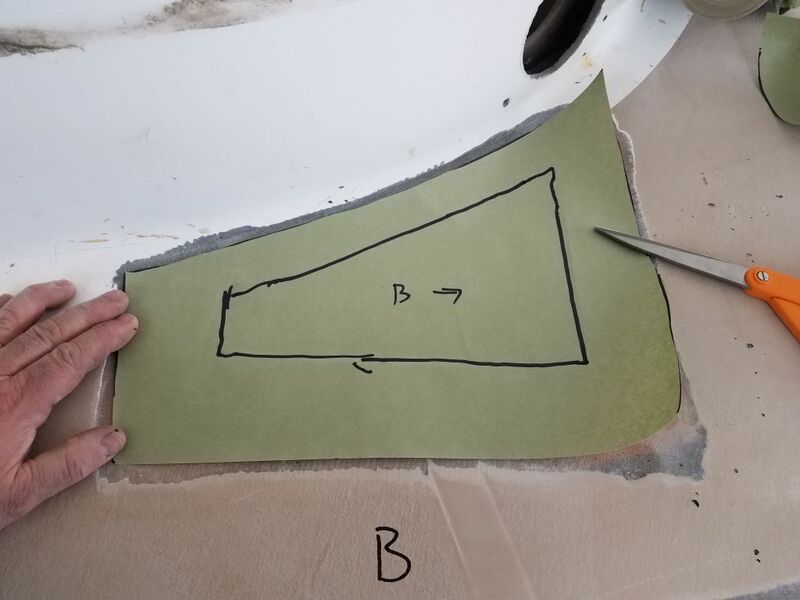 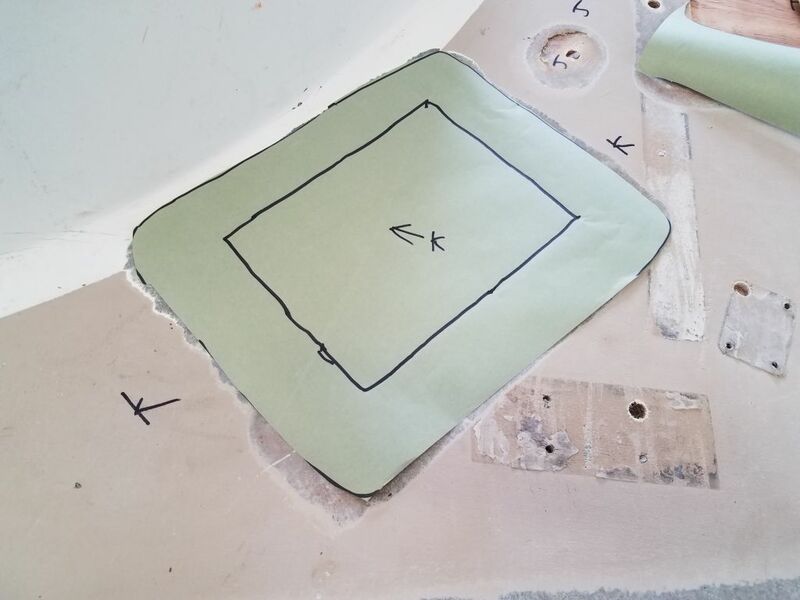 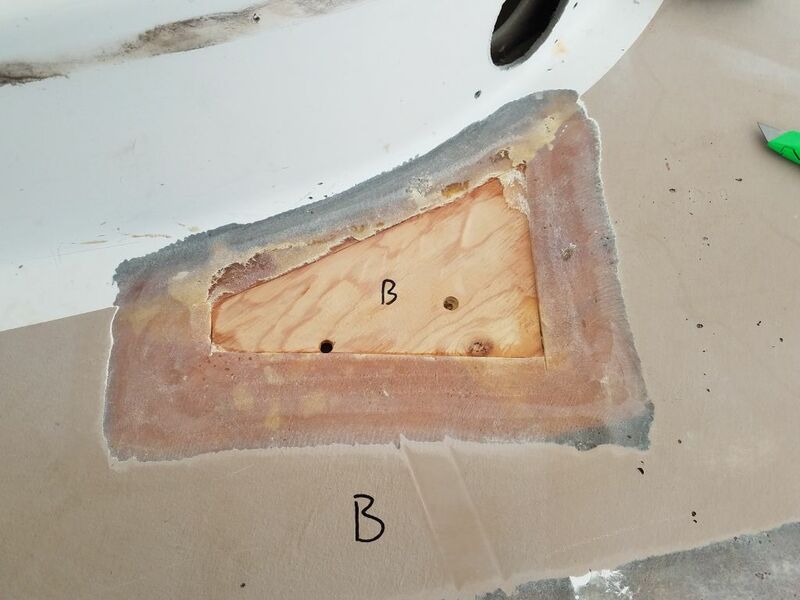 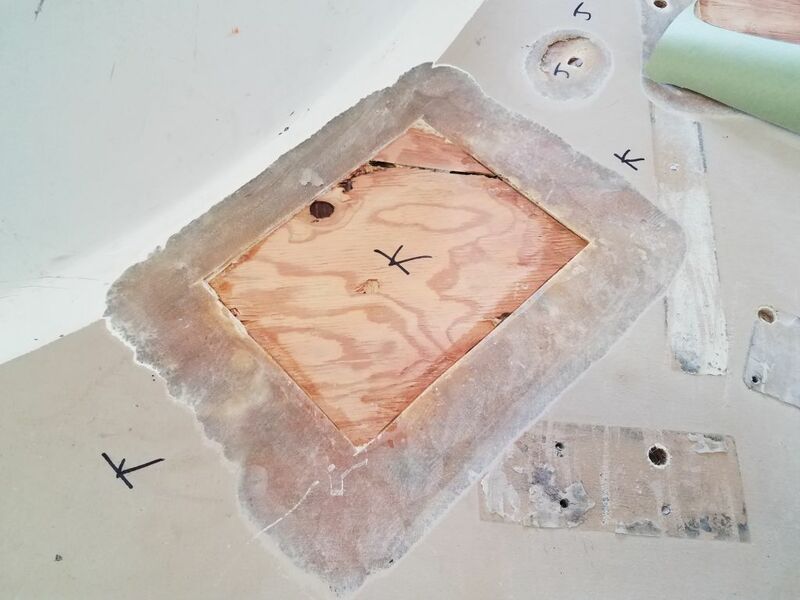 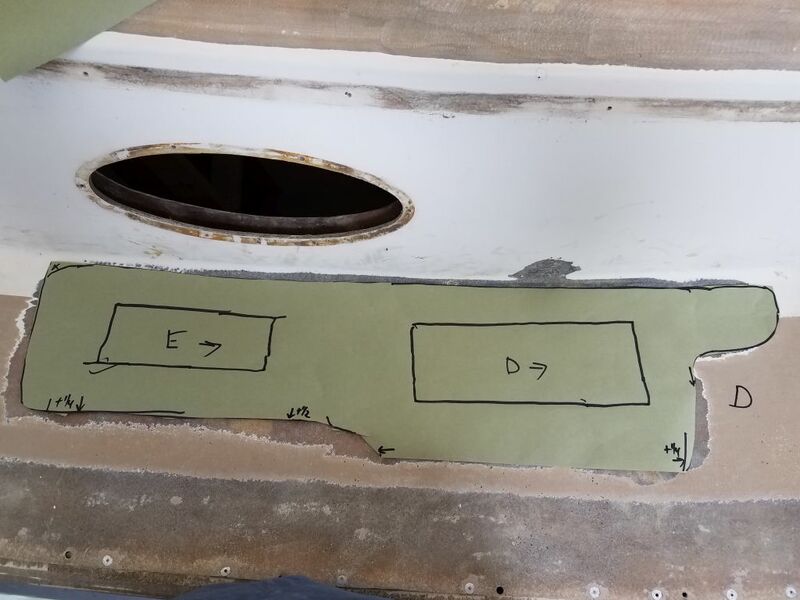 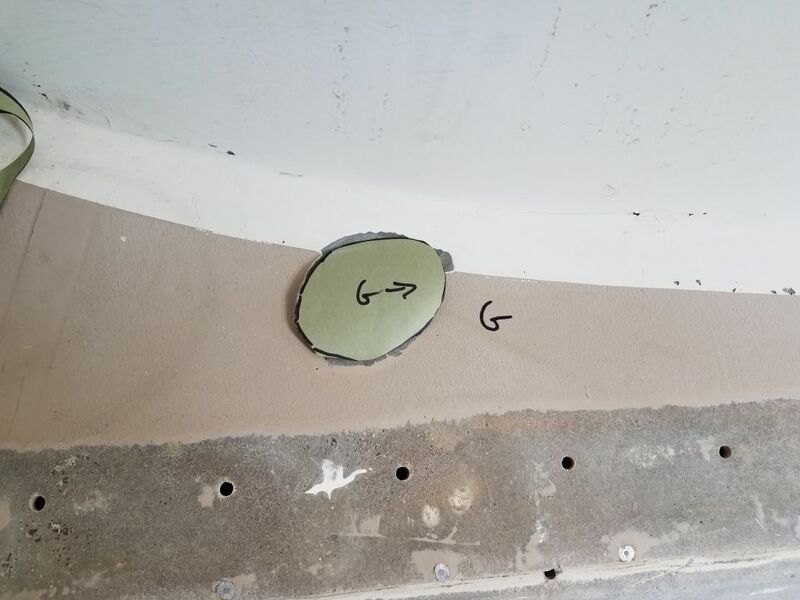 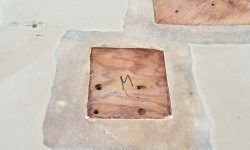 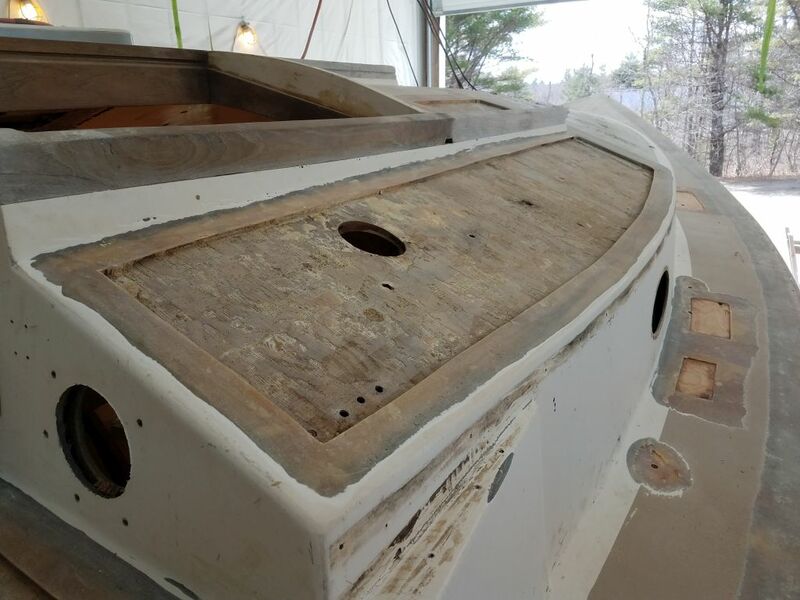 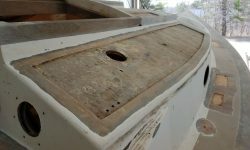 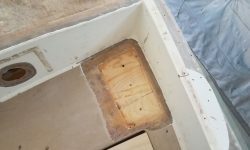 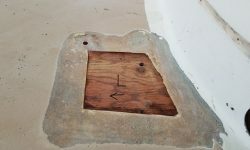 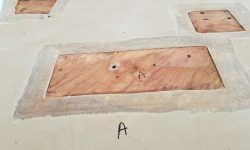 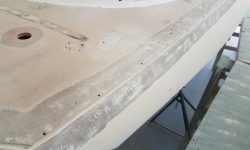 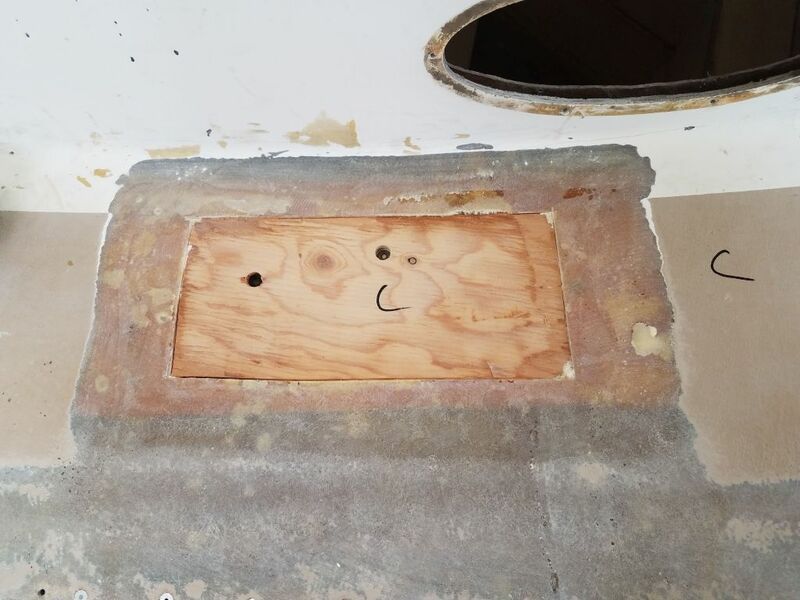 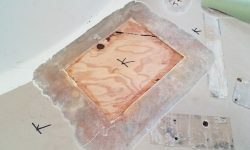 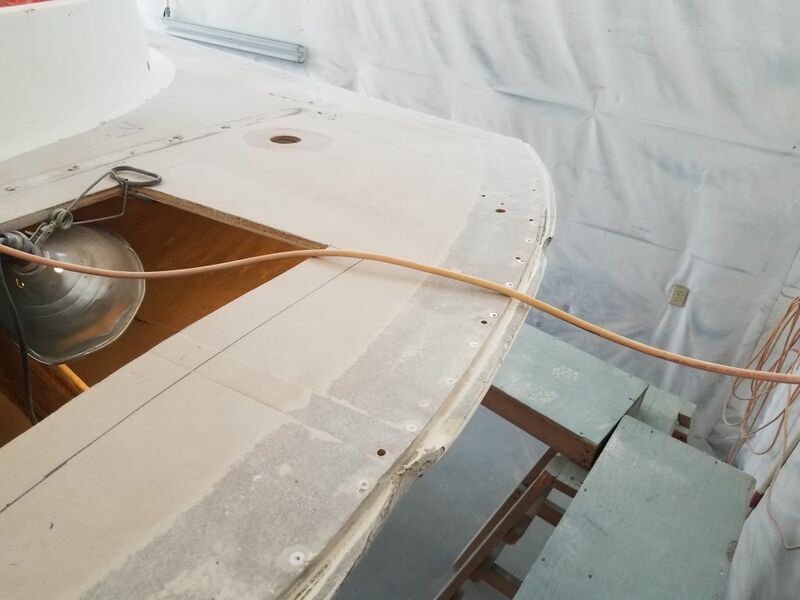 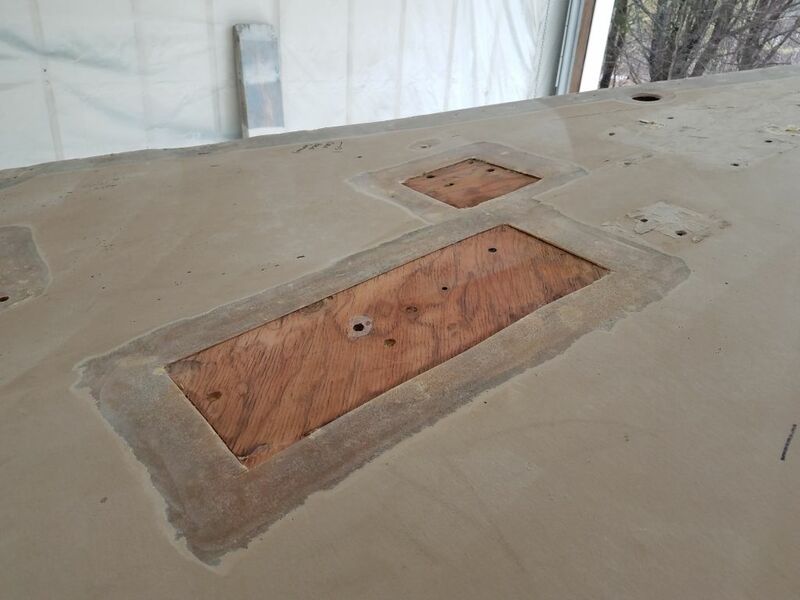 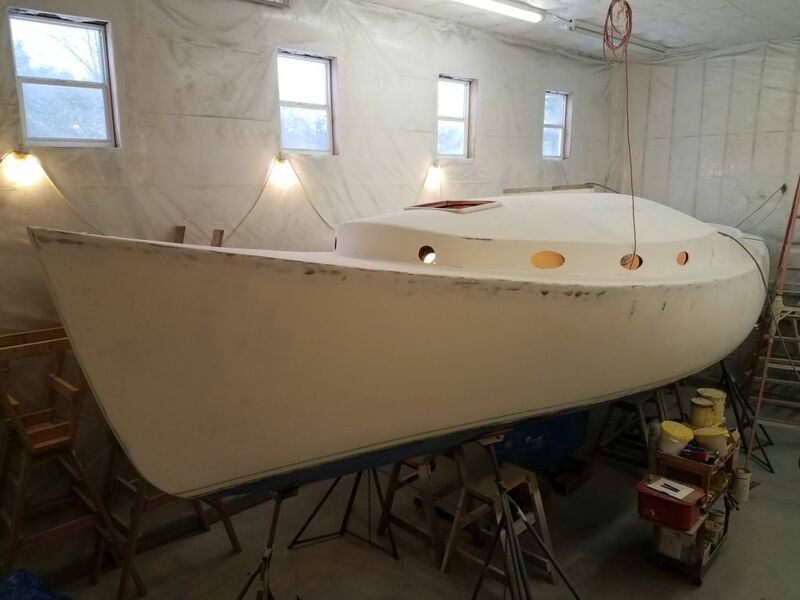 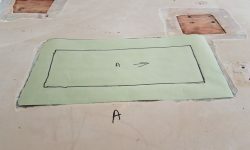 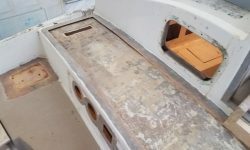 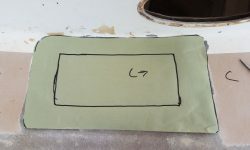 Picking up where I left off, I continued work on the hull/deck joint preparation, working my way past the starboard quarter and across the transom. 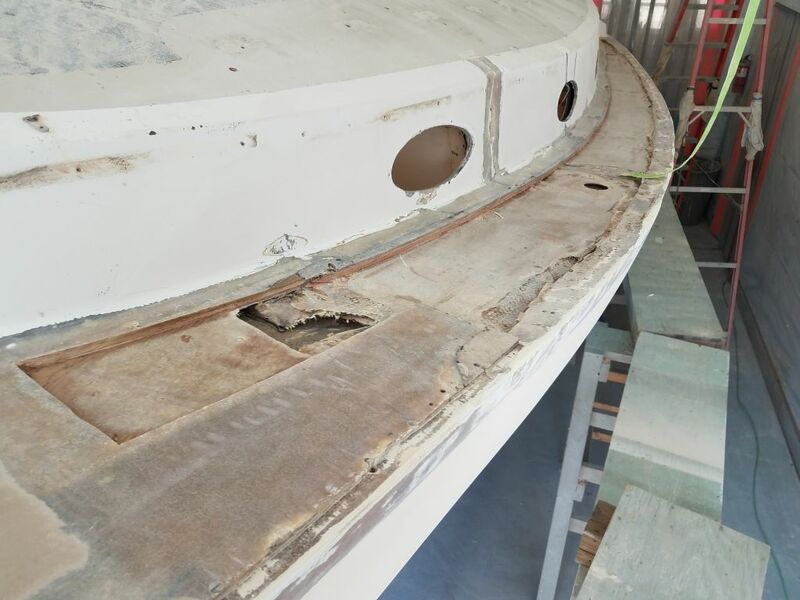 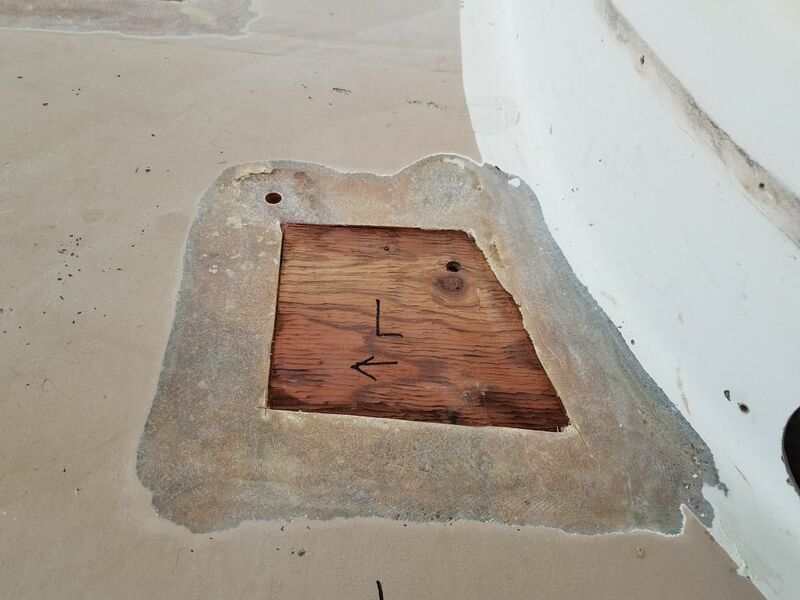 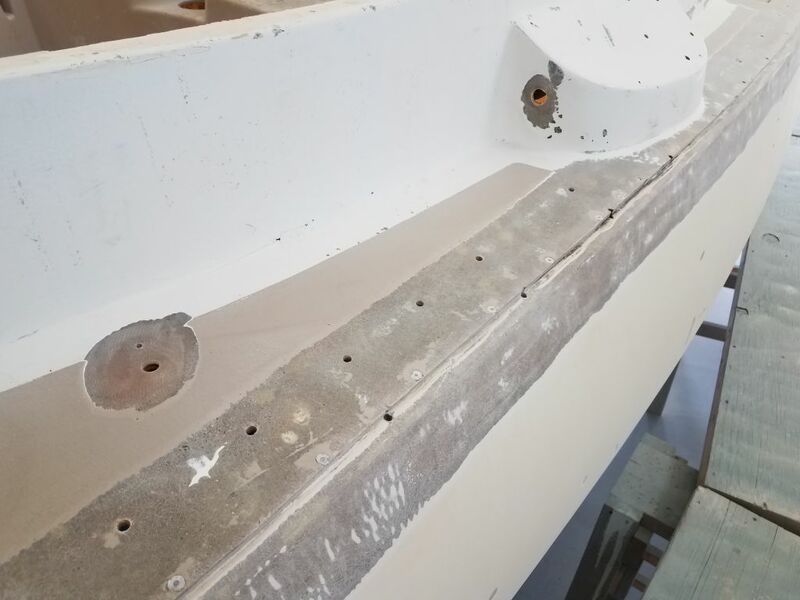 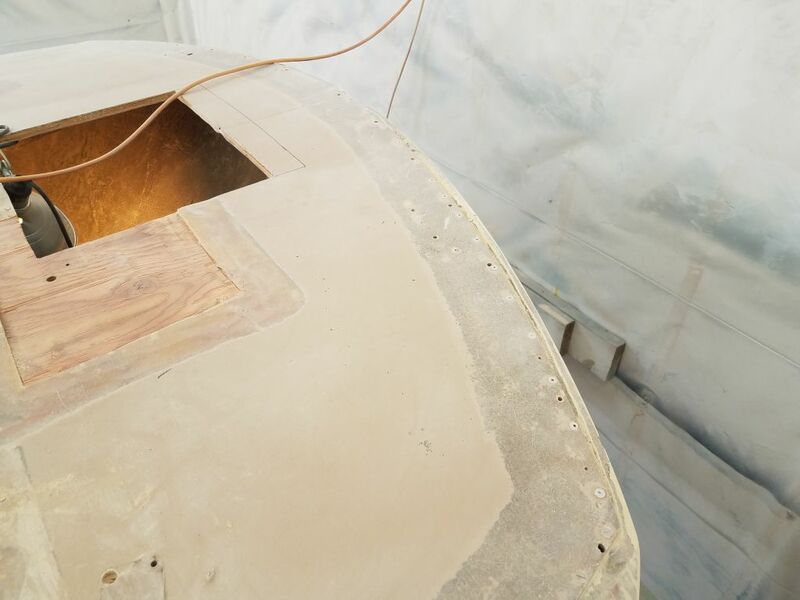 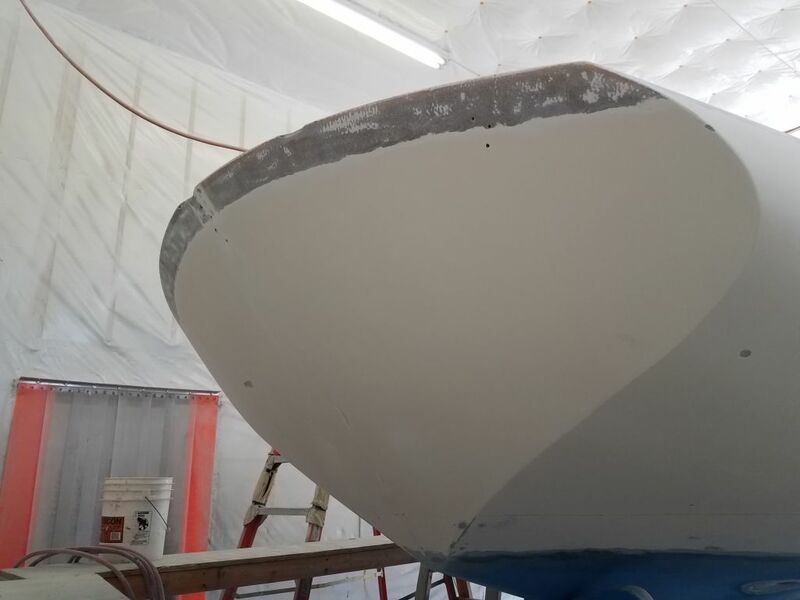 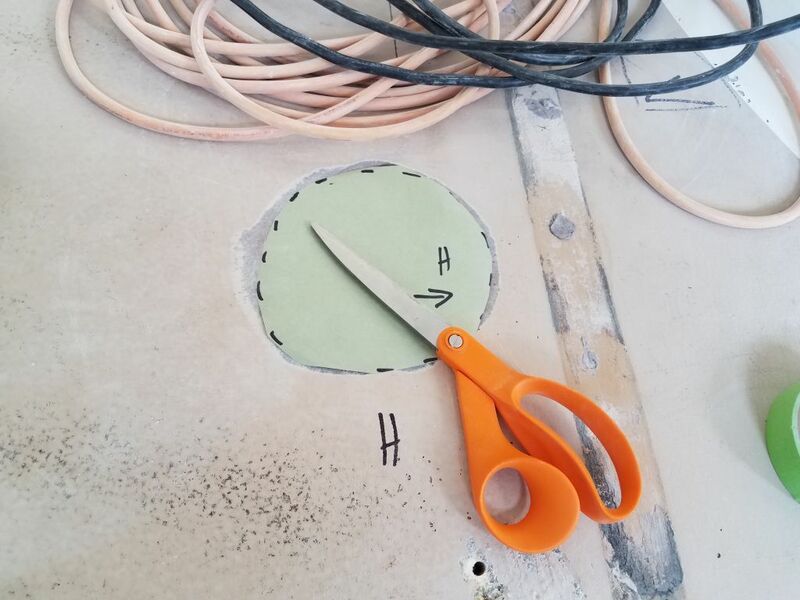 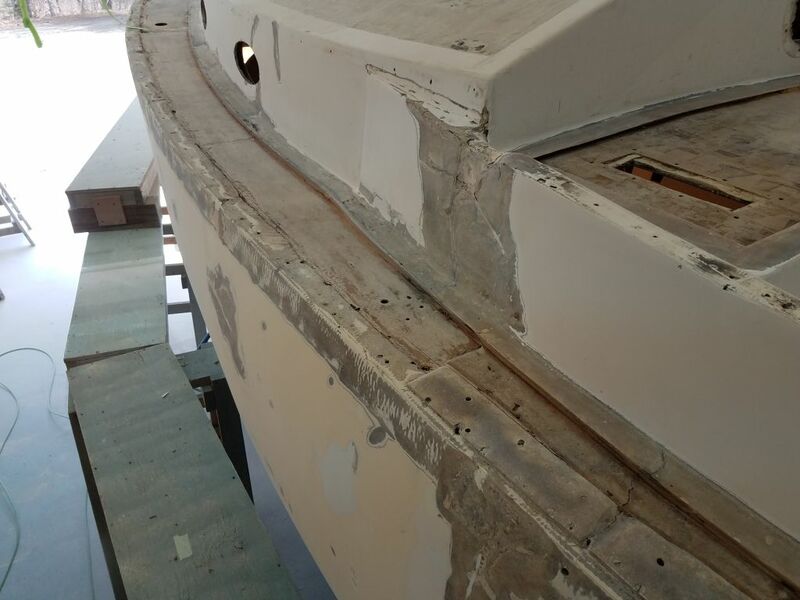 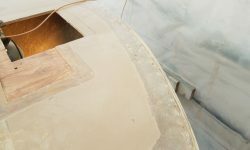 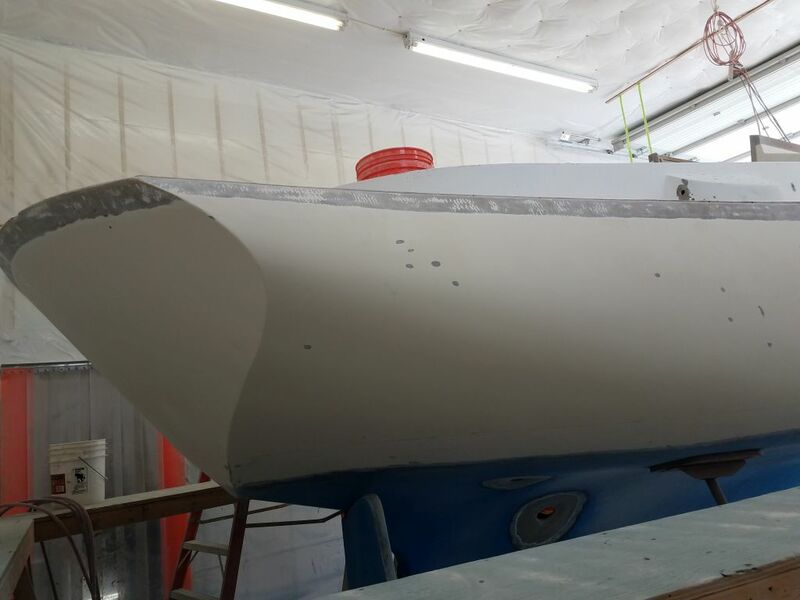 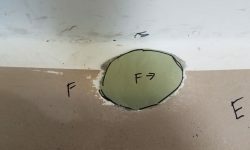 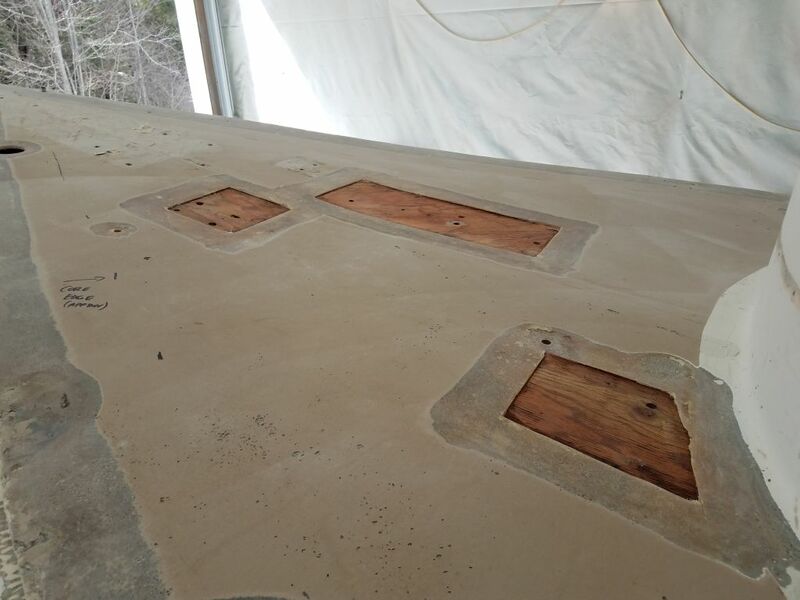 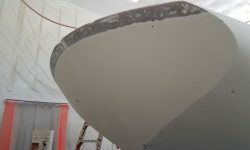 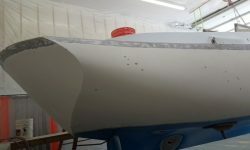 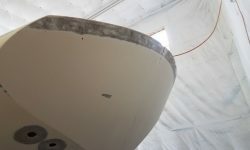 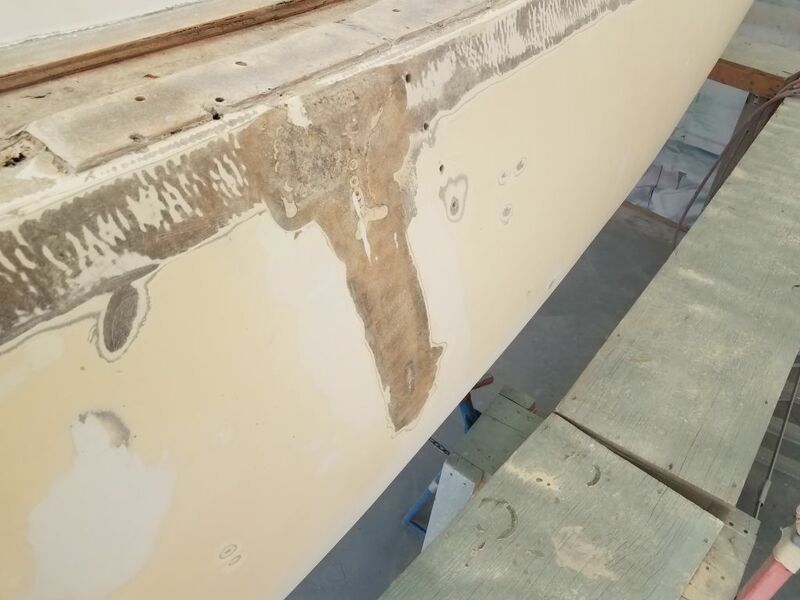 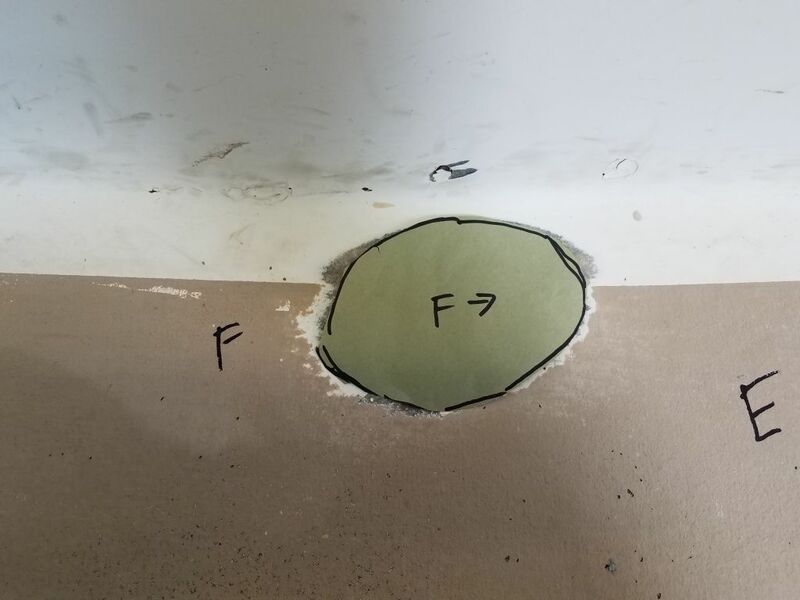 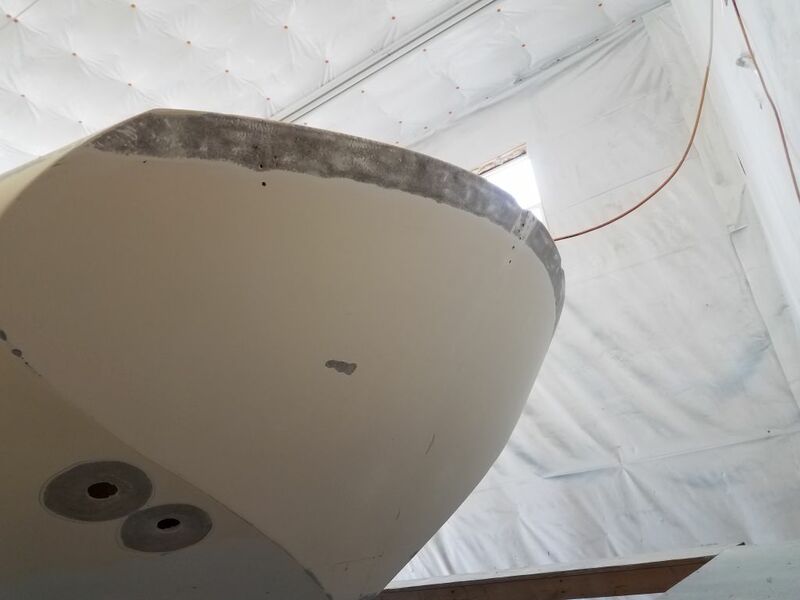 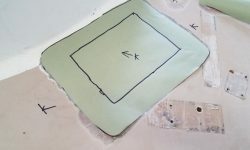 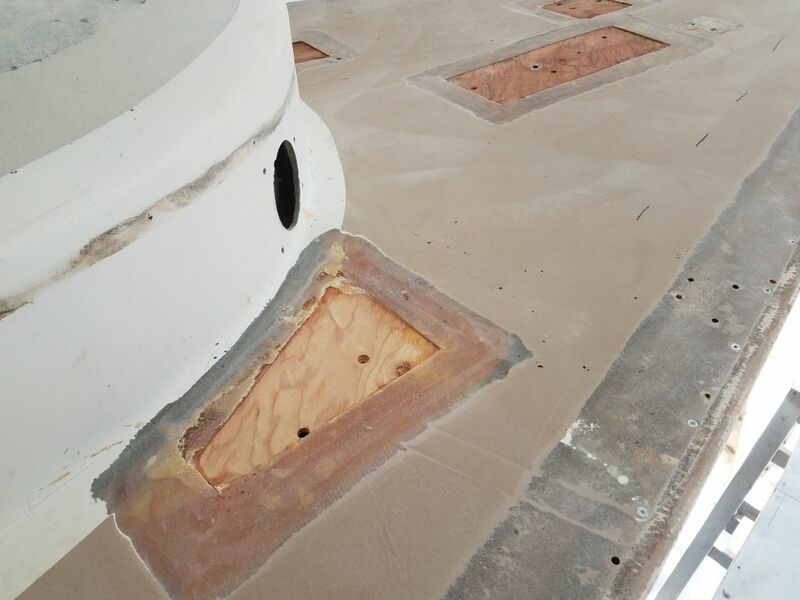 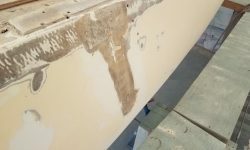 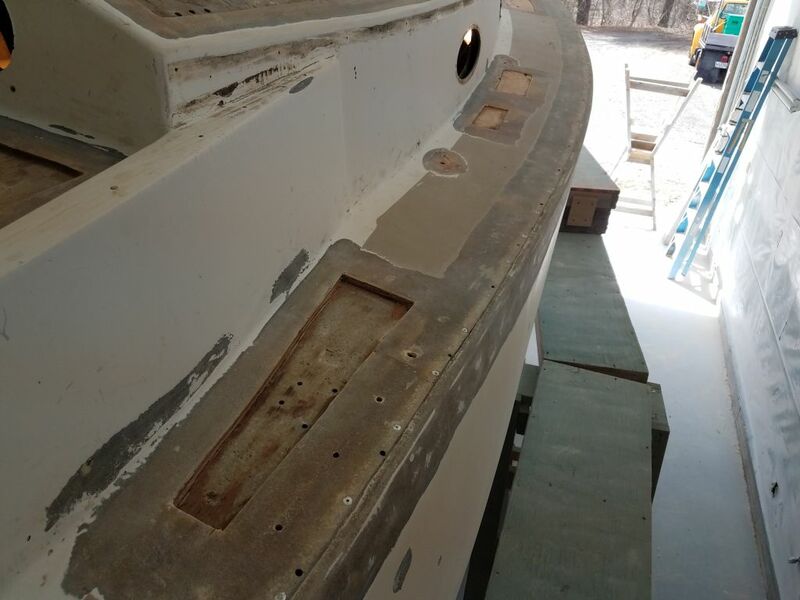 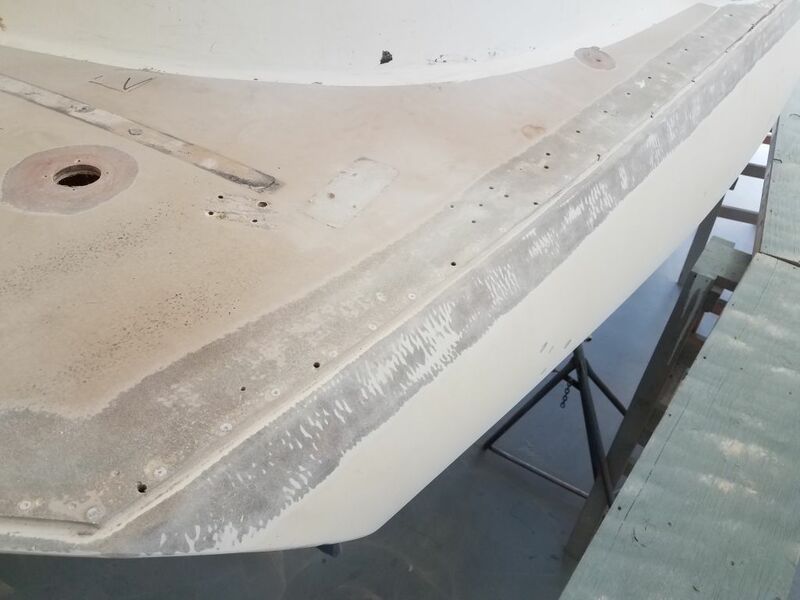 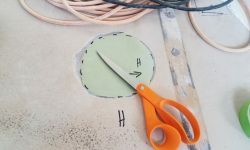 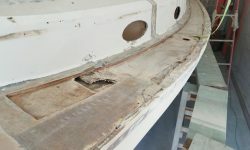 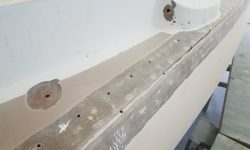 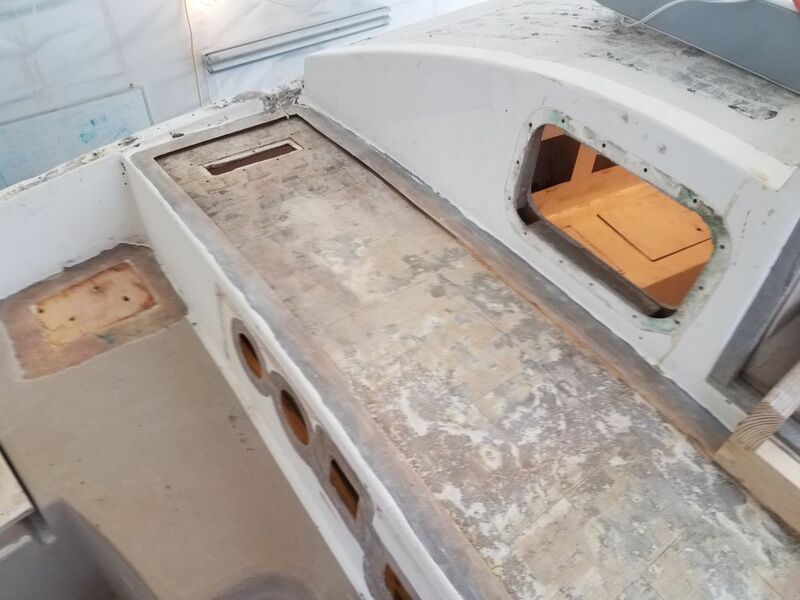 At the same time, I more thoroughly prepared an area on the port hull where some previous repair work had been, grinding out some suspect fairing compound and otherwise preparing the area for fiberglass reinforcement and refairing. 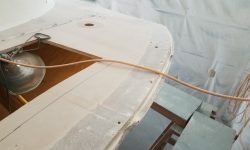 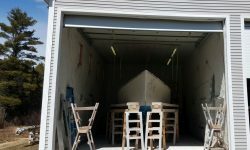 Though I’d been cleaning up incrementally throughout the week, the heavy sanding work had made a mess of the boat and shop, and while there’d be plenty more sanding to go as time went on, for the moment I was done and planned to focus on getting the decks put back together, so I spent some time giving the shop and boat a good cleanup. 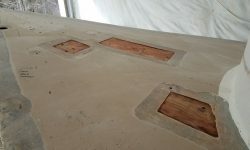 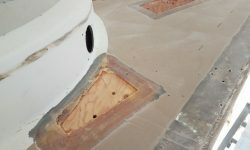 While I was at it, I went over the newly un-cored areas to ream out any final bits of core from beneath the deck edges and used an air nozzle to blow out the voids and help prepare these areas for new work. 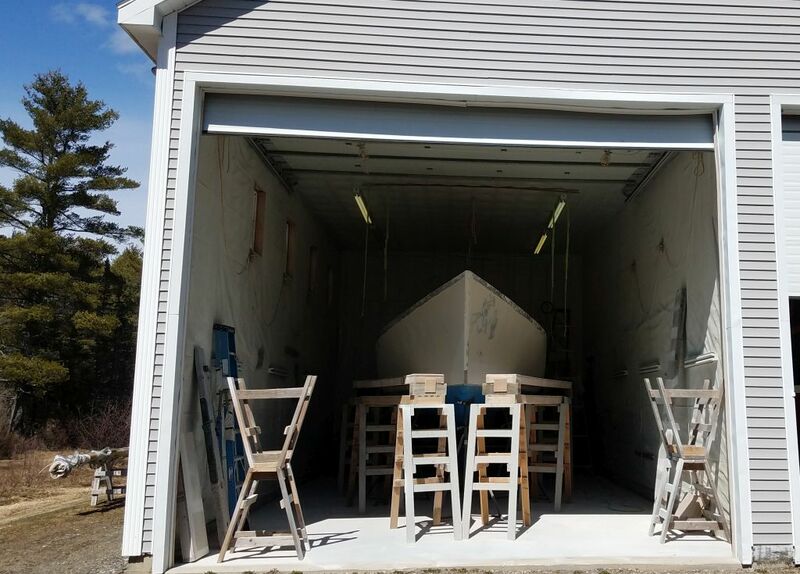 It was perfect timing for all this since for once the weather outside was door-worthy and pleasant for airing out the shop. 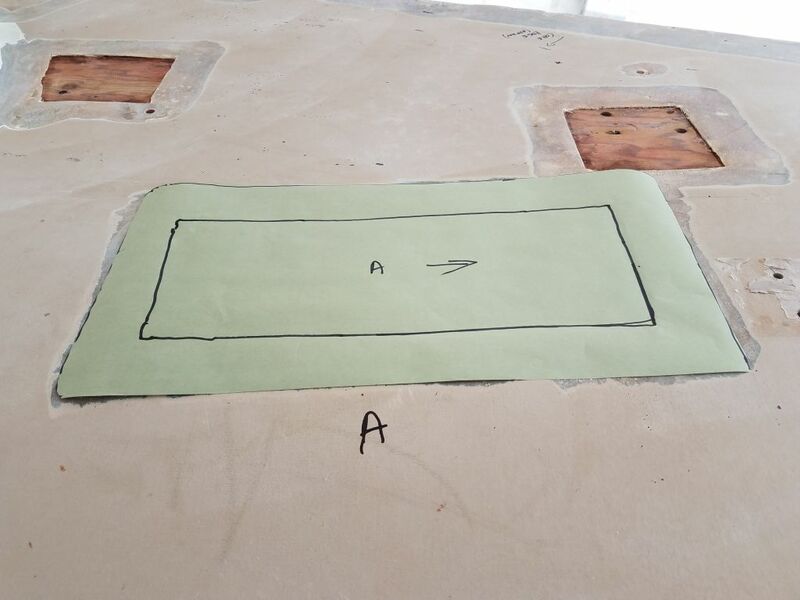 Later, I went around and made simple paper patterns of all the areas on the main decks that required relamination. 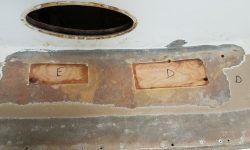 As the simplest of the repairs to come, I chose to make these the first on the list; plus, having the main decks closed up again and sound would make it easier to work on the coachroof and other areas. 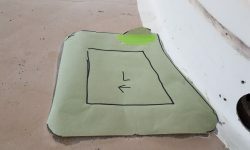 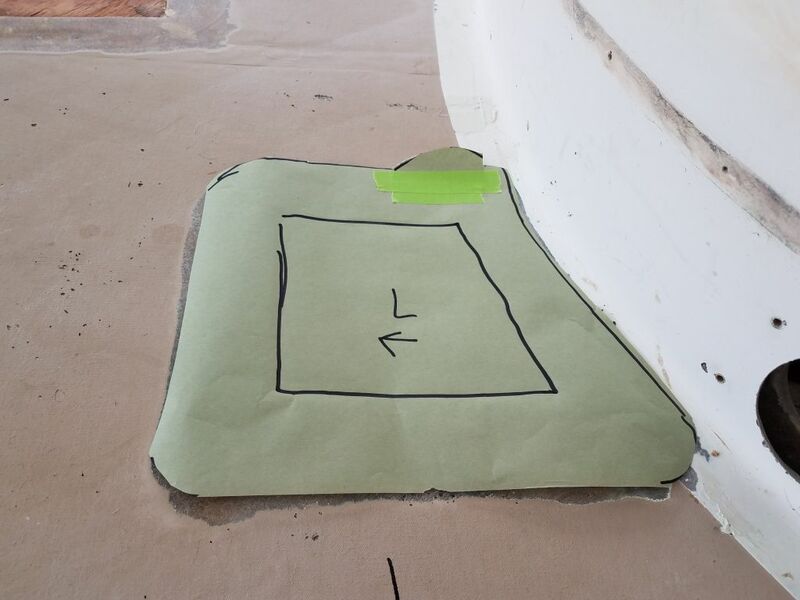 The outside of the pattern represented the largest piece of new fiberglass, which would extend to the outer reaches of the prepared areas on the adjacent decks, and the marked regions int he centers of each pattern represented the size of the deck opening itself, as I thought I might start with a layer of fiberglass directly over the exposed core so the subsequent layers would end up more flush in the end.